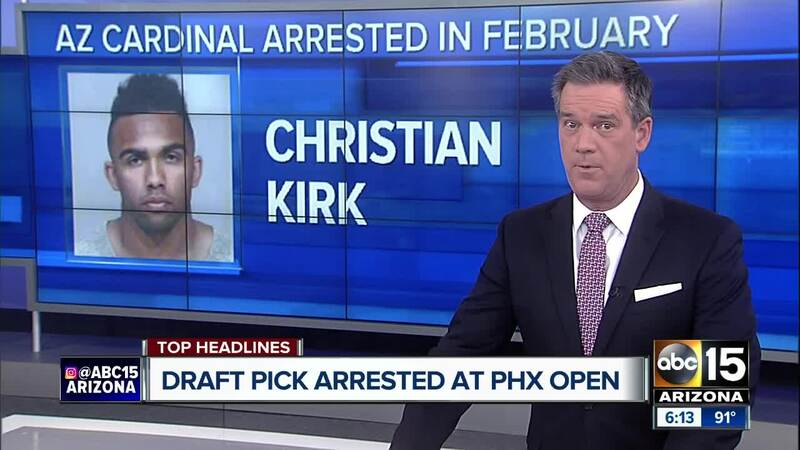 Arizona Cardinals second-round draft pick and Scottsdale native Christian Kirk was arrested and charged with criminal damage at the Waste Management Phoenix Open in Scottsdale in February, according to Scottsdale police. Kirk, a wide receiver who starred at Scottsdale Saguaro High School and Texas A&M, and a friend were seen throwing rocks at cars outside the Phoenix Open on the evening of Feb. 3, according to police. Per the police report, an officer responded to a report that two individuals were throwing rocks at car windows near Hayden Road and Mayo Drive. A witness on the scene who had just completed a day of work at the Phoenix Open was inside of his work-related 15-passenger van when he told police he "laid down on a bench in the van for a moment and heard a loud smack of an object hitting the van window." When the witness got up, he said he saw Kirk and his friend "actively throwing rocks at other cars." Per the police report, "No one else was in the area at the time that the van window was broken." The officer who spoke with Kirk smelled "an intoxicating beverage coming from his person," and Kirk's eyes appeared bloodshot and watery, according to the officer's report. Another officer on the scene said he noticed signs of impairment from Kirk and was concerned Kirk might assault one of the officers. "They were extremely intoxicated," explained Sgt. Ben Hoster with Scottsdale police. "They actually had a difficult time responding to questions." Sgt. Hoster adds the Scottsdale City Prosecutor later added a charge of disorderly conduct as well. "(Kirk) tried to answer a question but could only mumble a few noises," the officer on scene reported. "I looked back at (another officer) and Kirk and noticed Kirk was clenching his right fist against his right front pocket. I walked toward him and noticed that he was clenching his fists, then stretching his forearms and fingers. He did these very pronounced movements three or four times as I approached. "Fearing an assault on (the other officer) was imminent, I approached from the rear of Kirk and applied handcuffs. His arms were tense and flexed as I applied the handcuffs. I then assisted Kirk to a seated position. I further noticed the grinding movement of his jaw and continued blank stare. These are common signs of an individual high on stimulants, such as cocaine. "Kirk and (his friend) were placed in separate police vehicles for transport. As they sat in the rear of the vehicles I again noticed exaggerated grinding of the jaw on both offenders' face(s)." Per the report, officers on the scene established probable cause to arrest Kirk and his friend for criminal damage. They were released at about 4:30 a.m. the following morning. The 21-year-old Kirk was selected by the Cardinals with the 47th overall pick in the 2018 NFL Draft. He was rated by ESPN as the third-best wide receiver in the 2018 draft class. Kirk participated in the Cardinals' rookie minicamp last weekend. 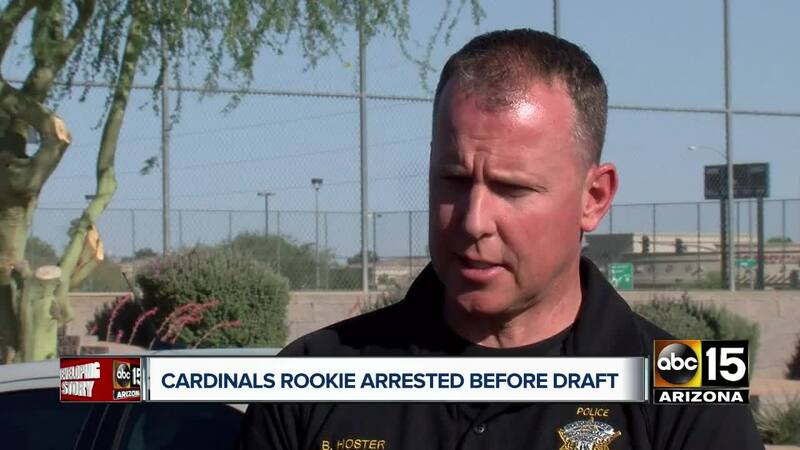 In a statement, the Cardinals said they were aware of Kirk's arrest before selecting him in the draft. “We spoke with Christian about it at length and also looked into it independently. Our understanding is that the process will be resolved in the near future but while it remains an active legal matter, we won’t comment further," the team said in its statement.